Can reach 80cm tall under ideal conditions. Family: Amaranthaceae (Spinach, Beet & Amaranth). 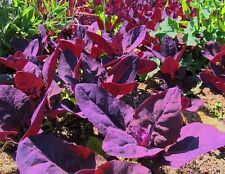 The purple leaves can be used raw to add colour to salads. Alternative they can be cooked briefly and used as a Spinach substitute, although they'll loose their vibrant purple colour and turn green once cooked. 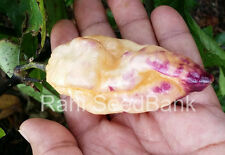 This is a rare long shaped and light peach-green habanero variety. If you love hot Habanero chilli then try this! They are a very high yield variety. The chilli turning from light white green to light orange & beautiful peach when ripe. 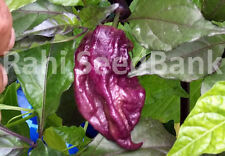 Pink tiger is one of the most stunning hot chilli variety you will ever grow! 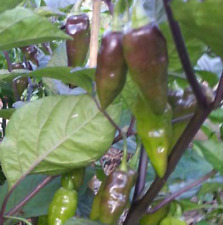 This beautiful dark black plant produces beautiful dark long pods that turning purple & pink when ripe. Colour can vary as it's still F2 but you will be surprised by the colur for sure! Dasheen varieties are 'Tsurunoko', 'Miyako', and 'Akado'. Dasheen or araimo, Japanese taro, also is used as a table taro. The Samoan Niue is primarily used as a table taro. Much of the taro grown in Hawaii is wetland taro, but upland taro production is rapidly increasing. 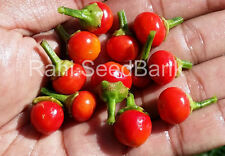 Jalapeno Jalafuego is beautiful & very high yielding hybrid variety and one of the hottest in Jalapeno family. This crispy & thick flesh chilli remains really good even though you freeze them for months. Okinawa Spinach is a family of Longevity Spinach. The leaves of Okinawa Spinach are shiny dark green on top and iridescent purple underneath while the leaves of Longevity Spinach are both shiny dark green on top and underneath. Dasheen varieties are 'Tsurunoko', 'Miyako', and 'Akado'. Dasheen or araimo. globulifera. Colocasia esculenta. The most common and easily accessible varieties in Hawaii are 'Lehua Maoli' and 'Bun Long'. Product Type: Bonsai. Variety: Vegetable. Function: Interest. Except Nigeria, Hong Kong, Taiwan, Macao, China, APO/FPO. Flowerpot: Excluded. ‘Ele‘ele Naioea. Ea is life, air, breath. Be careful if you decide to re-pot. Re-potting voids any warranty. Use NO fertilizers (this may kill your plants). Proper care is critical upon arrival. All plant materials are required by LAW to inspected and certified by USDA prior to export Hawaii to the US Mainland. Product Type: Bonsai. Variety: Vegetable. Function: Interest. Except Nigeria, Hong Kong, Taiwan, Macao, China, APO/FPO. Color: As Picture. Flowerpot: Excluded. Both plants are more than 6 months aged. These plants will also grow in vase as the picture showing too. 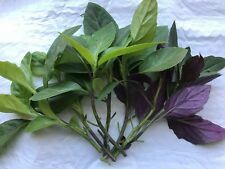 4 Okinawa Spinach, 1 Longevity Spinach Live Plant Live Plants, Handama, or Suizenjigusa,Gynura crepioides Live Plants.